Age: Old enough to keep quiet about it! When did you start cosplaying: Halloween 1995, first convention was in 1997. A : I've always loved working with my hands, and when I was a child I begged my mum to teach me to sew. I was never much into dolls but I liked making dresses for them! In my early teens I started wanting to make costumes based on TV and video game characters so I could wear them at Halloween, then I read an article about anime conventions and cosplay in a magazine and everything clicked together right then. A : The whole creative process is what keeps me making things. I love seeing projects come together and figuring out how to solve problems. And getting compliments from other people is always nice, too! For dislikes... it'd be nice if it weren't such an expensive hobby! I do get stressed with cosplay sometimes too, mostly because I'm not very good at time management and end up rushing to finish things (and then berating myself for it). I hate the early stages of making things too – cutting out pattern pieces and pinning them to fabric, I find it pretty boring and just want to move on to the more interesting bits! And while there are lots of lovely people in cosplay – most of my friends are people I met through cosplay – there are some people who take it a bit too seriously. You just have to learn to ignore them so they don't bring you down. A : The first costume I remember seeing that really blew me away was someone cosplaying as Maia from Persona 2, I don't know who the cosplayer was as it was at an American con and I only saw a photo online, but it was gorgeous. The first time I saw the photos from Volpin's Big Daddy photoshoot I was awestruck, that guy's craftsmanship skills are astonishing. On this side of the pond, xaerael does amazing work, he really deserved to win Eurocosplay with his Skeksis costume. A : I took part in a Team Rocket group at Ayacon in 2009, we did a little dance skit for the omake and it was fun. What made it memorable though, was right after the omake they held the charity auction and one of the lots was a giant plush Pikachu. I don't know how it happened but somehow we all decided to bid on it. We each agreed to put in up to £20 and started bidding. Things got a bit crazy because one of our friends, who wasn't in the group, was deliberately bidding against us to troll us – everyone in the auditorium was laughing and cheering. In the end we won – Team rocket captured Pikachu and the British Heart Foundation got £105 out of us. It was so much fun, I can't describe it. To this day, it still makes me grin when I remember it! Q : Typically do you buy or make your own cosplays? A : I usually make my costumes. I don't mind commissioning a prop or wig if I don't think I can do it myself, but I get so much more satisfaction out of trying new things and making everything from scratch. I did commission a Luka costume once – I was entering a talent competition, they didn't care if your costume was commissioned or not, I needed a singer and Luka's one of my favourite Vocaloids – but I felt like I was cheating somehow! A : Figuring out the tunic for Ursula was pretty tricky. I used a Mandarin top pattern as a base but modified it so heavily that I had to make little toiles out of paper and do lots of experimenting with the fabric and bits that I had to cut out in order to make it look right. I'm so pleased with how it came out in the end though. Ursula is probably the most experimental costume I've made so far – I've been doing this so long that I've started looking for costumes that will challenge me, so Ursula was a good experience and I expect my future costumes will be even more complex. I'm working on a Moldiver costume at the moment and I think I'm going to have to build my own vacuum former to make the visor, so that'll be interesting! A : Apart from Moldiver, I have a few that I've been working on for a while, like Viola from Eternal Sonata and Teresa from Claymore. I have a few costumes that I never finished off properly too, like Nakoruru and Vice, so I'll be finishing them off soon hopefully. I'm moving towards film costumes now too, and I've been working on something awesome for a while now - I'll wear it at a London Expo when it's finished but I'm taking my time with it because I really don't want to screw it up! I'm planning to enter the UK WCS heat with my friend Luke next year too, but we're keeping our costumes under wraps for now just in case it doesn't come together! A : I'd love to do an Infested Kerrigan from Starcraft or Hexadecimal from Reboot. I need to seriously hit the gym first though! A : A few times. There was the Team Rocket group, and I cosplayed as Zafina in a Tekken 6 group a few years ago, which was great fun – we had a proper fight on the stage and everything! Some friends and I are trying to get a full Breath of Fire IV group together too, which would be great – it's not a series you see cosplayed from very often. A : Terrible! I still enjoyed the con but I felt really sad looking at everyone in cosplay, like I was missing out. Now that my costumes are well-made enough to last longer than a weekend, I try to rewear them if I don't have a new one ready. It's a lot less stress that way! A : I always try to get photos with Nert (www.manylemons.co.uk), he's a great photographer and also one of the most genuinely lovely people in the British fan scene. He has a really good eye for what will make a good photo, great ideas for poses and camera tricks he can do, and he works really well with the people he shoots – I've probably driven him nuts by not having many ideas for poses over the years but he's always really nice about it. I don't do many photoshoots though, really, not sure why. Luke always takes several photos of me in costume so I mainly rely on him. 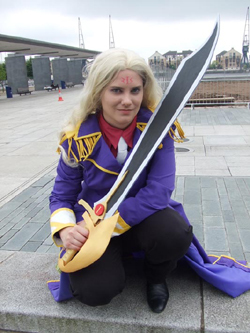 A : I always do Minamicon, it's only a small event but it has a fantastic atmosphere. I always go to either Ayacon or Amecon too, depending on which one is running since they alternate years. I'll be at Hyper Japan too, and probably London Expo, provided I have a costume to wear at it. A : Yep, I'm on Cosplay Island and Cure as Sillabub, Coscom as Leah-H, and Cosplay Lab as Leah. A : My deviantART page I guess!